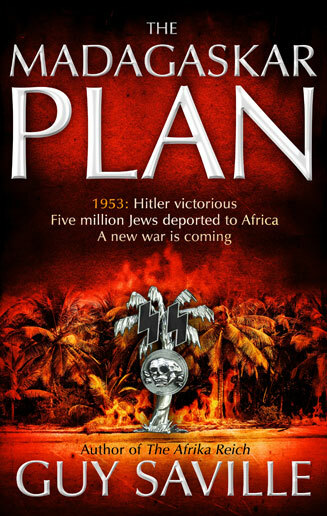 Before I began writing The Afrika Reich, I planned the two books that would come after it. Each would be standalone, but read together they would tell an overarching story. In publishing, as with many of the creative arts, there’s a pressure to repeat initial successes. Although I understand the commercial reason for this, my concern is that it leads to doing the same book over and again. This holds little interest for me as a writer; I thrive on taking new paths. So when it came to the follow-up to The Afrika Reich, I knew from the start that I wanted a distinctively different story and mood. The Madagaskar Plan sees less of the frenetic action of the first book, and a greater emphasis on the characters, politics and world-building. It was important that it had a darker, more serious tone. I also changed the relatively simple narrative structure of The Afrika Reich to a complex, interweaving one where different strands intersect and influence each other, often invisibly. [Spoiler alert] Globocnik, for instance, never shares a scene with Burton or Salois, yet his actions have serious repercussions for both of them. Some elements of the original book were quietly dropped: dambe and Burton’s missionary background are good examples. The conflict between Burton and Hochburg remains at the heart of this second book, but more than anything else I see it as a love story and a tale of endurance. 1953. After the disaster of Dunkirk, Britain and her Empire are diminished. Nazi Germany controls much of Europe and a vast African territory. There has been no Holocaust. Instead, the Jews have been exiled to the island of Madagaskar. Six million crammed into a tropical ghetto ruled by the SS. Burton Cole is a man alone in this world. Returning to Britain after a fatally compromised mission to Africa, the former mercenary finds his lover, Madeleine, has disappeared. Desperate to discover what happened to her, he is drawn into a conspiracy that will lead him back to the Dark Continent. Meanwhile, the man who has haunted Burton’s whole life, Walter Hochburg the Nazi Governor of Kongo, has turned his attention to Madagaskar. He has heard of certain scientists among the prisoner population – scientists who could develop a new weapon of unimaginable power. But Hochburg is not the only one looking to Madagaskar. The British want to destroy the island’s naval base to bring America into a war against the Reich. They have found the ideal man for the task: Reuben Salois, the only Jew to have escaped the island. The only one brave, or foolhardy, enough to return. In the months that followed, feverish planning to create a ‘Grossgetto’ (super-ghetto) in Madagascar gripped the Nazis. An initial proposal was completed by Franz Rademacher of the Foreign Office, its purpose made explicit in the first paragraph: ‘all Jews out of Europe’. Shortly afterwards Heydrich (Himmler’s deputy) got word of the scheme and assigned the SS to it develop it further. The finished text of the ‘Madagaskar Projekt’ was delivered on 15 August 1940 and circulated at ministerial level. This is the most detailed account there is of how the Nazis intended to run the island and was the factual basis for my novel. The SS identified four million Jews to be transported. To move this number a fleet of 120 ships would have to be procured, each ship with a capacity of fifteen hundred people, two ships to leave daily. With a return journey time of sixty days that would mean approximately a million Jews per year. Jews were to be sent in waves with the first transports consisting of farmers, construction experts and craftsmen. The plan would be financed by the compulsory acquisition and sale of all Jewish property and assets. The island itself would be divided into sectors by country of origin. Jews would be put to work building new roads and railways, and redirecting rivers. A council of Jewish elders would help run the regional sectors, a system Heydrich had used in occupied Europe; the council would be subservient to the SS. Jews would be allowed their own internal postal, health and police services. As Madagascar would be a German mandate, and because Jews were barred from German citizenship, they would hold no nationality. The island would be placed under the direct control of an SS police governor. Categorically, Madagascar would never be allowed to become a state. 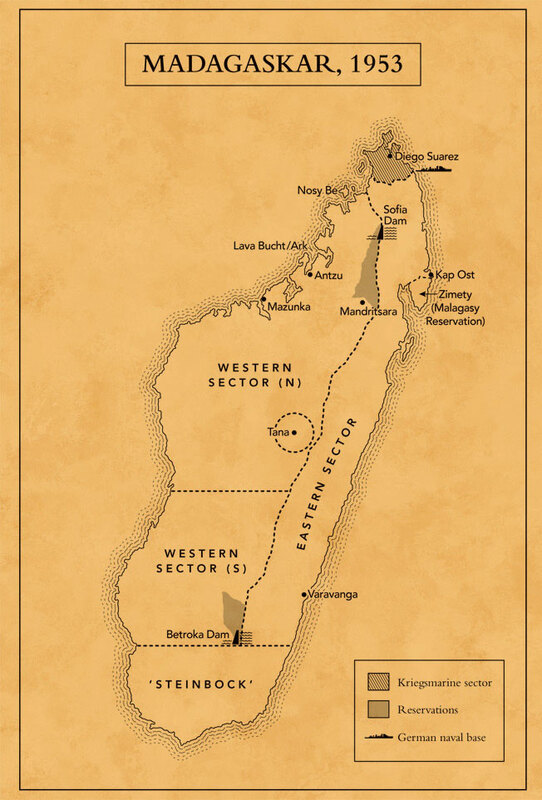 For a more detailed account of the real history, including references and further reading, see my ‘Author’s Note’ at the end of The Madagaskar Plan.